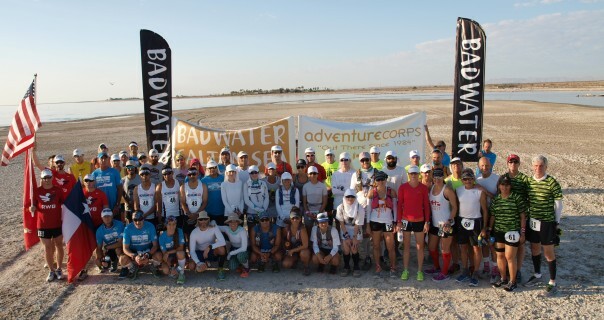 AdventureCORPS®, Inc. hosts BADWATER® Salton Sea annually in late April (previous in early May.) This remarkable event challenges up to 25 teams of two or three ultrarunners – running together as duos or trios for the duration, NOT in a relay – to tackle an unimaginable traverse of Southern California deserts and mountains. The route covers 81 miles (130km) non-stop from below sea level at the shoreline of the Salton Sea, across, up, and over Anza-Borrego Desert State Park, to the top of Palomar Mountain with a dramatic view of the Pacific Ocean. The inaugural race was held in 2013 and was received with wide acclaim. Fourteen teams competed in 2013 and nineteen teams competed in 2014. The third edition – with a 25 team limit – will be held May 3-4, 2015. The BADWATER Salton Sea route is 81 miles from Salton City (elevation 125 feet below sea level) to Palomar Mountain, the almost tallest mountain in San Diego County (finish line elevation: 5500 feet above sea level.) There is a total elevation gain of over 9000 feet. Eight of the 81 race miles pass through Anza-Borrego State Park on a single track trail known as the California Riding and Hiking Trail from near Borrego Springs to near Ranchita, creating a race route which is a mix of road and trail. Special thanks to the Race Staff!